Acclaimed as “one of the greatest musicals of our time” (Daily Mail), “a wicked and wonderful vision of Oz” (London Evening Standard) and “one of the West End’s true modern classics” (Metro), WICKED is already the 17th longest running show in London theatre history and recently celebrated a decade of performances at the Apollo Victoria Theatre, where it continues an open-ended run. Around the world, WICKED has now been seen by over 50 million people in 15 countries, and won over 100 major awards (including 3 Tony Awards and 6 Drama Desk Awards on Broadway; 2 Olivier Audience Awards, 9 WhatsOnStage Awards and an Evening Standard Theatre Award in London; 6 Helpmann Awards in Australia and a Grammy Award). 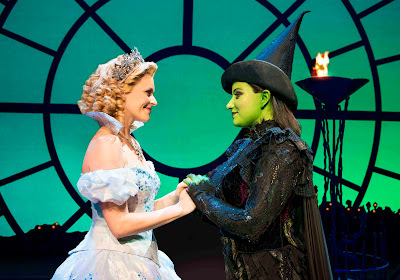 WICKED played a fifteen-city tour of the UK & Ireland from September 2013 - July 2015, winning five-star rave reviews at every venue. The production, acclaimed by the Northern Echo as “the ultimate Broadway experience for theatre audiences all over the UK”, resumed touring in July 2016, playing a sold out engagement at the Alhambra Theatre in Bradford and is currently playing in Hong Kong and opens at The Theatre at Solaire in Manila on 2 February. Prior to returning to the UK & Ireland, WICKED will also play engagements in Shanghai and Beijing. WICKED is produced around the world by Marc Platt, Universal Stage Productions, The Araca Group, Jon B. Platt and David Stone. Executive Producer (UK/International Tour) Michael McCabe.